Oh so special. Dell introduces the new and completely redesigned Inspiron notebooks - including two SE (Special Edition) models - the Inspiron 15R SE and 17R SE. Aluminum accent panels for the chassis, a more powerful graphics card and a better display all help differentiate the SE models from the standard. 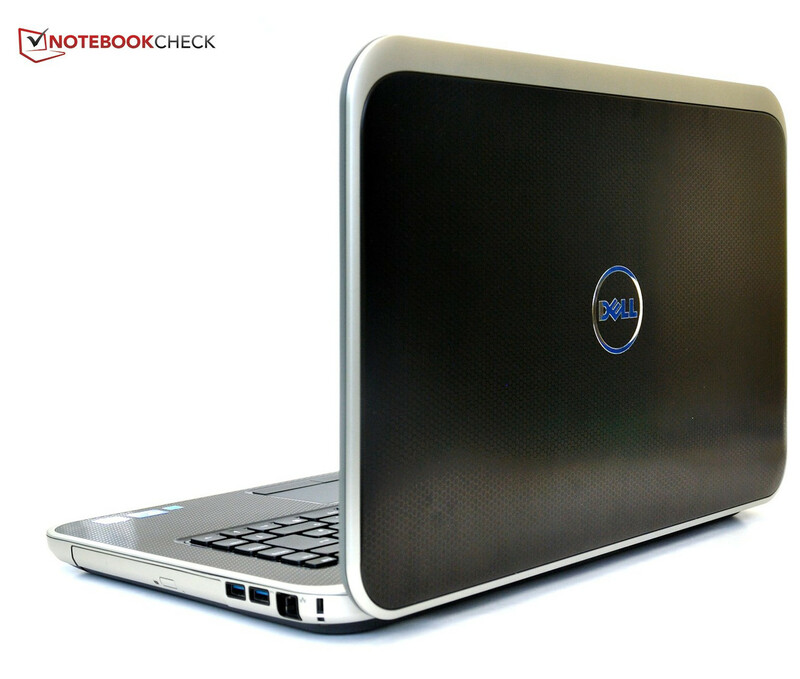 Dell introduced the new generation of Inspiron notebooks on June 5th - at the same time as the updated Intel Core processors. While the last refresh didn't bring about any changes to the chassis, this time around the systems are a completely new design. It pays to be careful when shopping around: the name hasn't changed, so old and new models coexist (even on Dell's homepage). We would recommend looking at the chassis and the hardware rather than just the name. 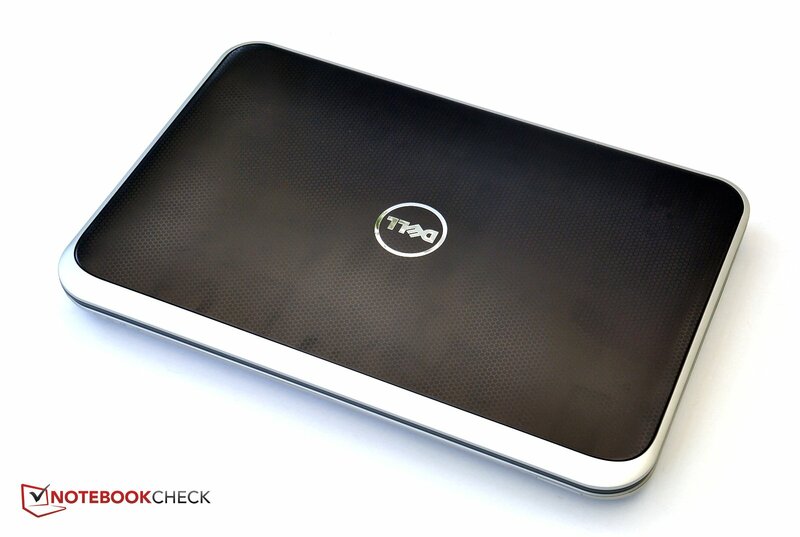 The Inspiron Series R features plastic construction, the Inspiron Serie R Special Edition on the other hand sports an anodized aluminum display lid and palm rest. This improves the feel of the unit and provides more rigidity. 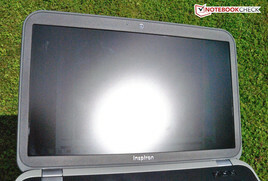 A non-glare FullHD-display is an option, as is a dedicated graphics card (Radeon HD 7730M with 2 GB dedicated memory). 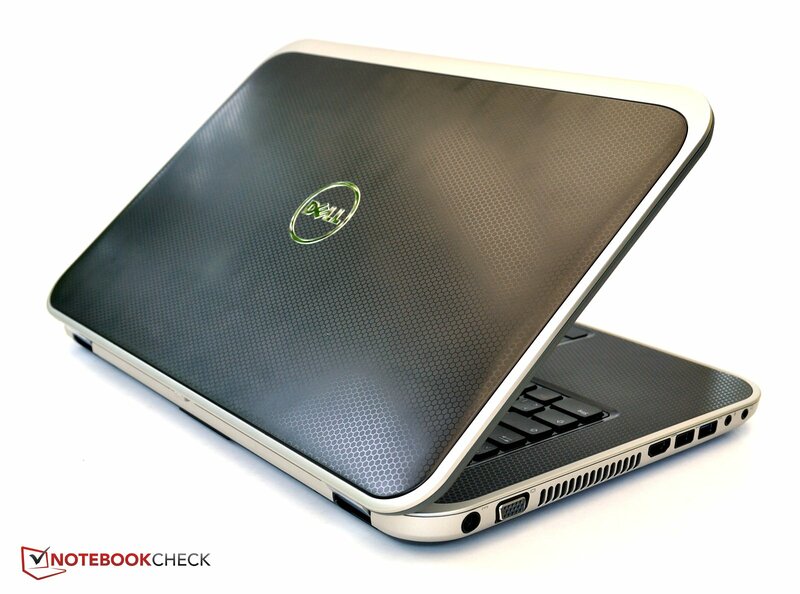 The old Inspiron-series was the top-selling notebook-line for the Texan manufacturer. At least partially responsible for the success: Switch, the interchangeable display lids offered in a variety of different colors and off-beat designs. The new models offer the same feature, but the lids are not compatible with the old ones. The design is completely new. 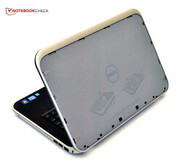 The unusual placement of the hinges, a distinctive feature of older Inspiron and Vostro models, has been abandoned in favor of a new design. The hinges are now located at the far back of the base unit. Unfortunately, the display lid still can only be tilted back about 140°. The lid is made out of plastic which accepts the interchangeable aluminum covers as inserts. With the cover in place, the display is very resistant to any pressure applied. The hinges are strong and easily keep the display in the desired position. The base of the unit, save for the palm rest, is made from plastic. The chassis is torsionally very rigid but the surface areas deform under pressure. Build quality could be improved: the top appears well constructed, on the sides we noticed uneven gaps. 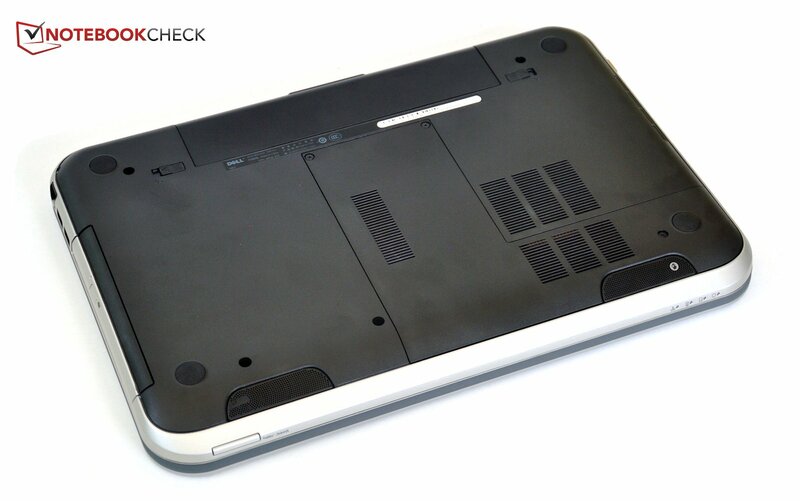 The locking mechanism for the battery is very solid and user friendly. Most of the surfaces are non-glossy. The interchangeable aluminum cover and the palmrest are made from black anodized aluminum and feature an embossed (but subtle) honeycomb pattern. The sides are made from silver plastic. 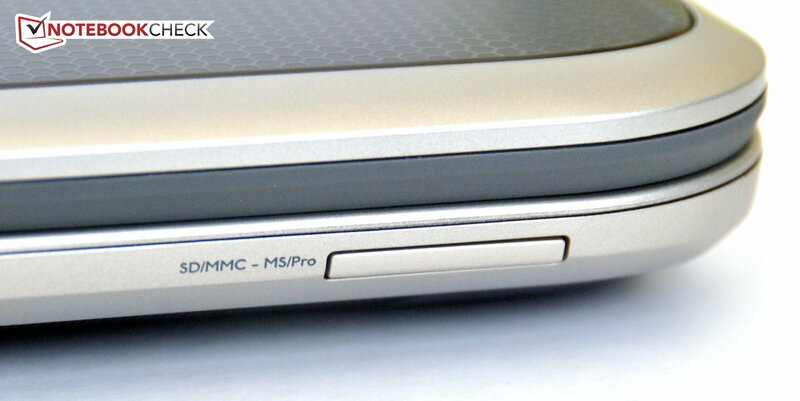 The three quick access buttons and the keyboard panel are painted glossy. 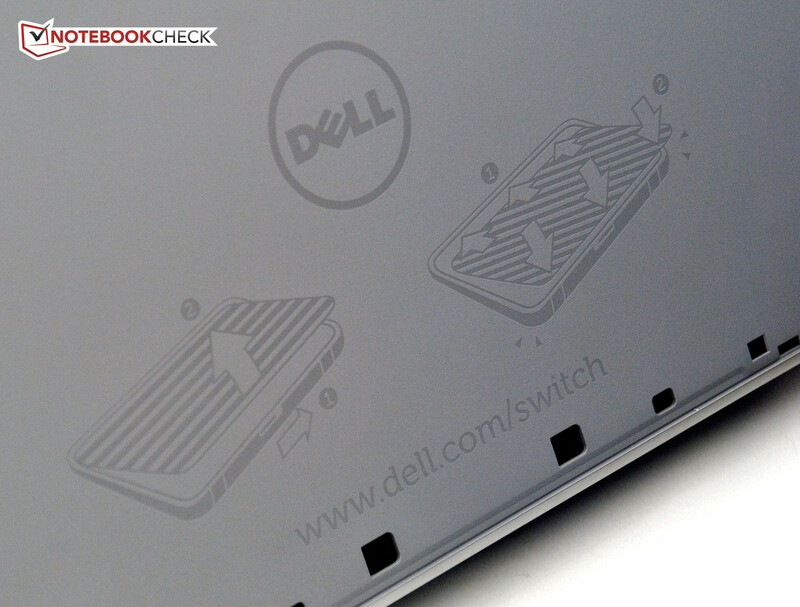 With Switch, Dell is trying to separate the Inspiron notebooks from the rest of the pack. Unfortunately, the selection of covers leaves to be desired. At this time, only a pink, a red, and a blue cover are available for the standard Inspiron 15R. Additional aluminum covers are not offered. The process of changing the cover is easy and thoroughly explained. Port selection is above average. The front houses a card reader (compatible with SD, SDHC, SDXC, MMC(+), MS (PRO), and xD). 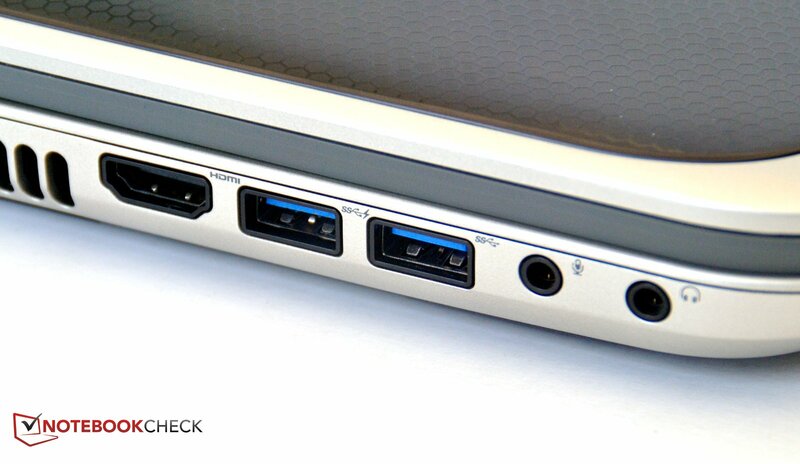 The right side is home to a Blu-ray optical drive in the front and two USB 3.0 and the Gigabit LAN jack towards the back. The notebook is not particularly well suited for left-handers wanting to use an external mouse: the headphone- and microphone-jack, a regular USB 3.0 and one USB 3.0 that is always powered, are on the left side towards the front, followed by a HDMI port. 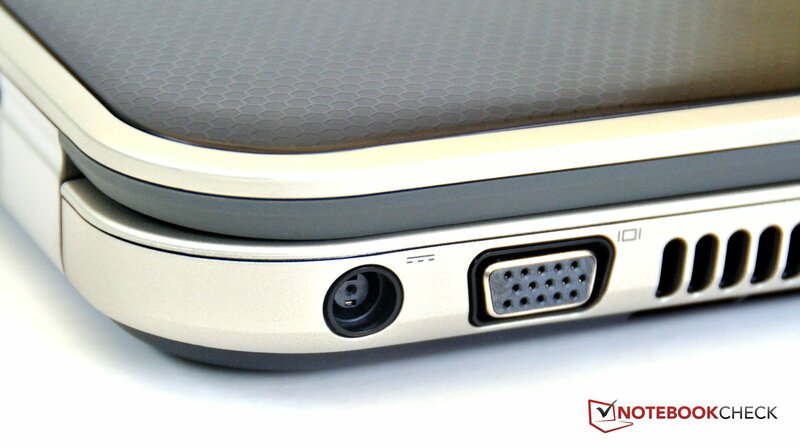 A VGA port and the power jack are located behind the cooling fan outlet. 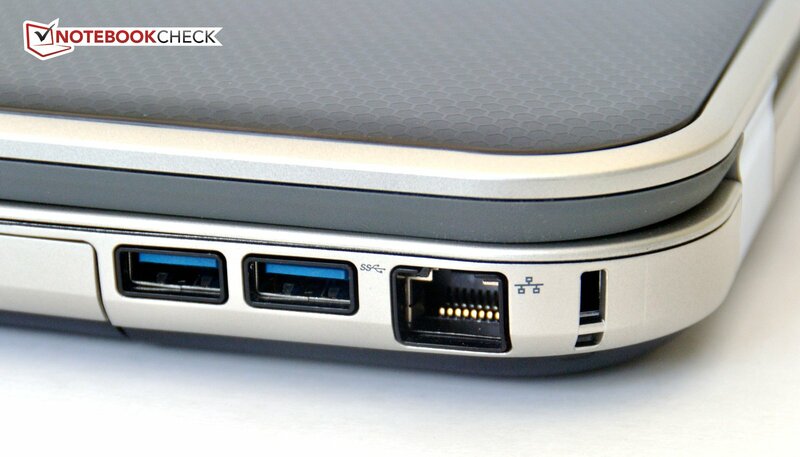 No ports are located on the back. On board are the standard Gigabit LAN and WLAN b/g/n. Bluetooth Version 4.0 is also available. 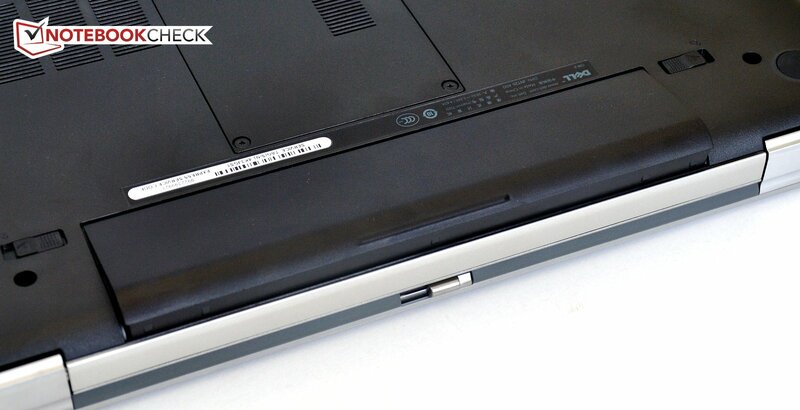 A big cover on the bottom allows easy access to the hard drive and the memory modules. 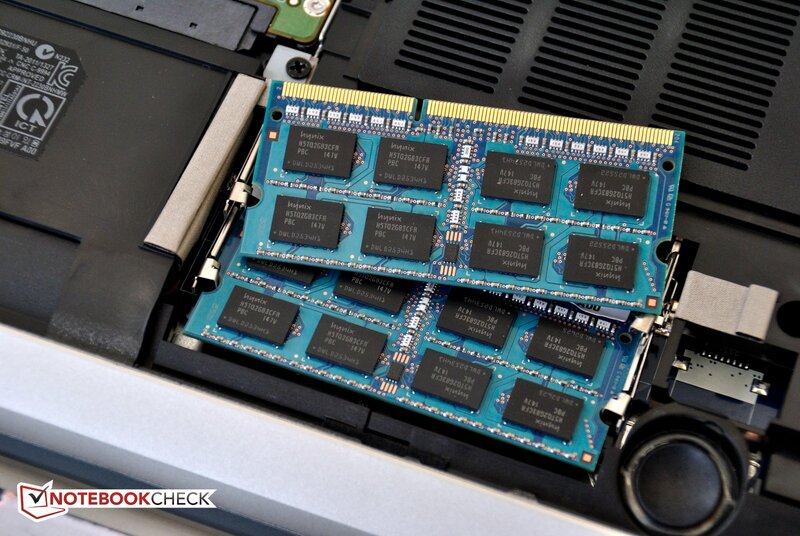 Our test model had both RAM slots occupied (8 GB RAM). The fan unit can't be cleaned since it's not accessible. The standard 1-year warranty includes in-home service free of charge. More comprehensive phone support is available for a fee of 25 Euro. For 130 Euro, the warranty coverage can be extended to 3 years. The keyboard is different from the predecessor's: while the design is similar, the numeric keypad is missing. The keyboard is now the same one found on some Vostro models. A backlit keyboard, the same one the Vostro V131 features, is available as an option (40 Euro) on the top-of-the line model. Typing is a pleasure: the key travel is not too short and the feedback is solid. 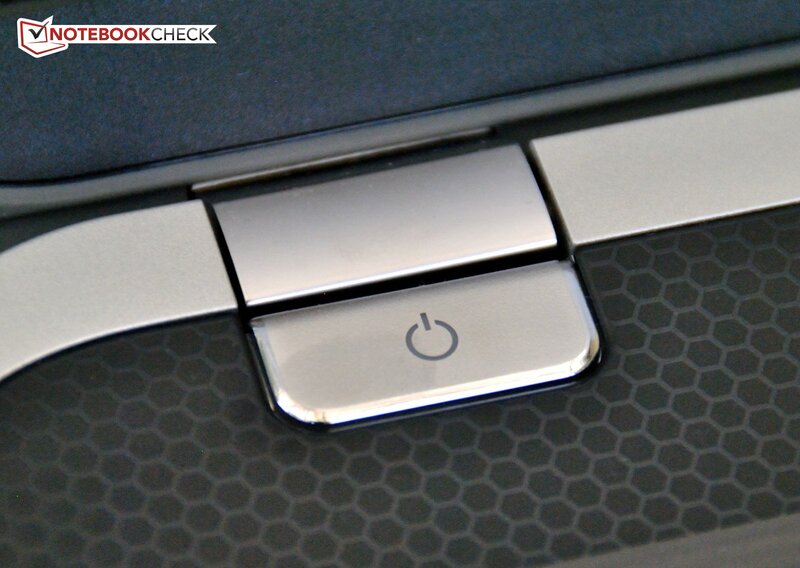 Aside from the fairly big and backlit power button, the Inspiron features three shortcut buttons on the top right. The first one opens Windows Mobility Center, which provides an overview of frequently used settings. The second one opens a small window that lets the user choose a profil for the sound card (game, music, movie,..). The third key can be customized as desired. 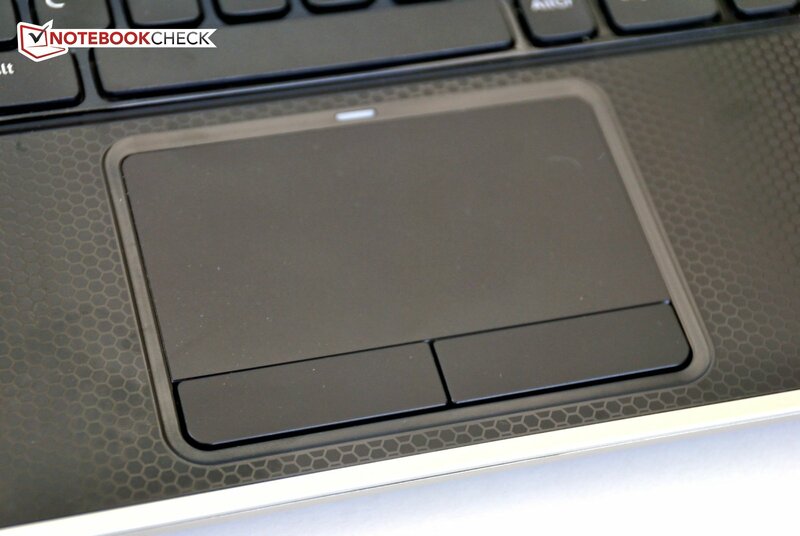 The touchpad is adequately sized and allows for precise control. It features a definite (and easily felt) perimeter although the extreme borders don't respond that well. Multitouch is supported and works without issues. The driver properties allow for a plethora of configuration settings so the touchpad can be customized as desired. 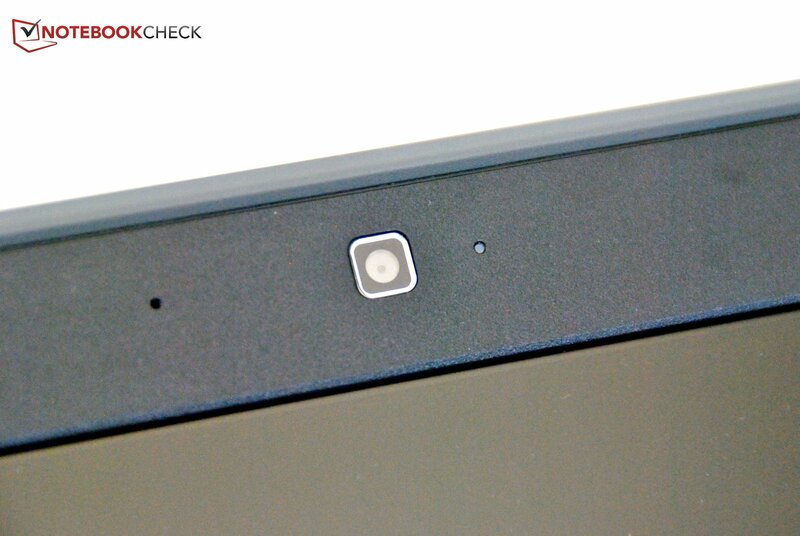 A key combination turns the touchpad off; a little orange light glows above the touchpad when it's deactivated. The two mouse buttons are a pleasure to use. They offer clear tactile feedback and respond well even if not pushed dead-center. Dell has two display options for the Inspiron 15R SE: one is HD with 1366 x 768 pixel, the other is fullHD with 1920 x 1080 pixel. Our test systems features the FullHD-display from AU Optronics. This screen (model B156HW2) is non-glare. At the upper left of the display we measured 300 cd/m² - a value that we don't get to see very often. Towards the right the display brightness decreases: in the right-hand middle of the screen we saw 255 cd/m² - almost 50 cd/m² less. As a result, the display brightness distribution isn't very good. 84 % is still OK though and not something that's very noticeable during daily use. The average brightness is very high - not many notebooks can reach 280 cd/m². 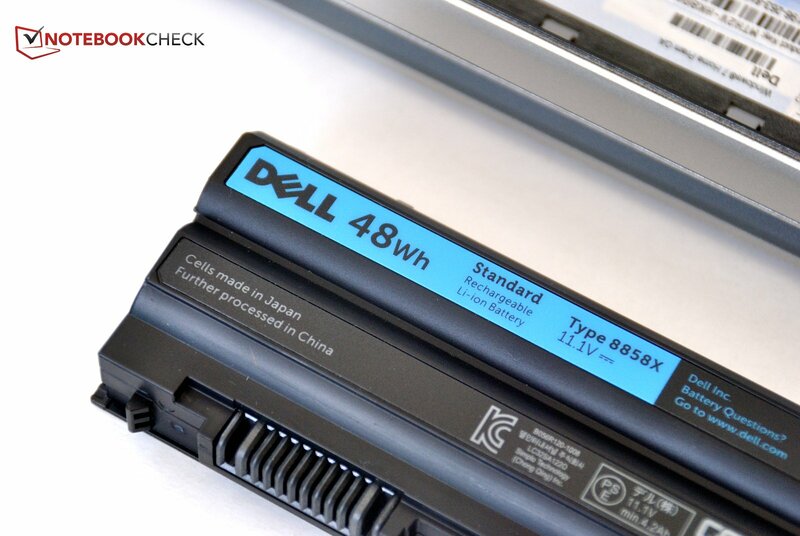 The display brightness range doesn't change even when the Inspiron is running on battery. The black value, at 0.55 cd/m², is also pretty decent. Combined with the above-average brightness, this results in a contrast ratio of 533:1. Photos and movies look a lot more vivid and text is easier to read. The display does not adequately reproduce the professional color spaces. Neither sRGB nor the even more demanding AdobeRGB are covered. 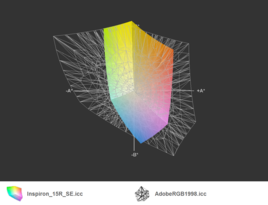 We don't think this is an issue for most users, as color spaces are more important to professionals working with graphics or photographers. 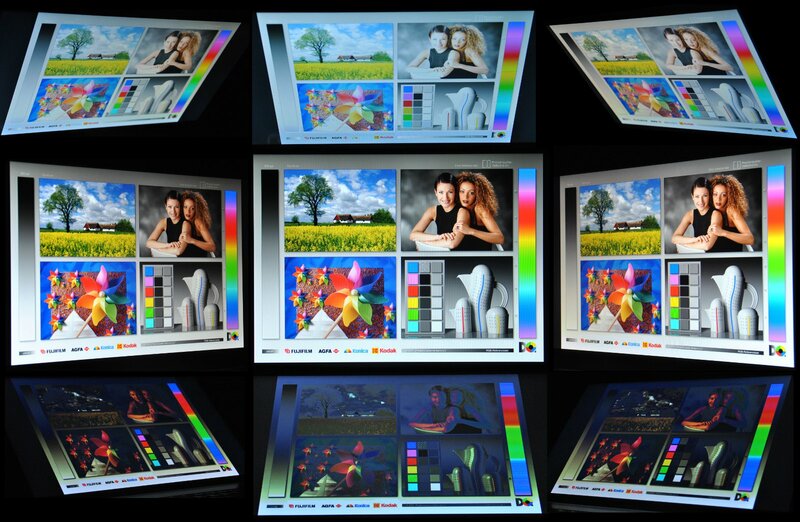 Because of the high brightness levels and the non-glare screen, the display can be used in very bright conditions without any issues. It remains very readable even in well-lit rooms. Outside the display does well unless directly exposed to the sun. The display remains very stable even when the viewing angles change. From the side, colors remain vivid, only the overall brightness is reduced. Even viewed from above, colors remain stable up to a point. Increasing the angle further leads to color inversion, although text remains identifiable. 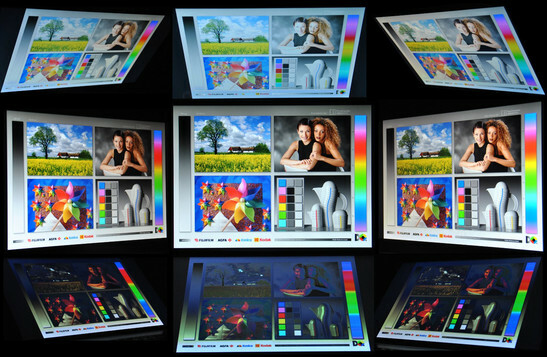 When the display is viewed from below, colors change and the picture gets dark fairly rapidly. Dell currently offers two third-generation processors from Intel: the less expensive models feature the dual-core Core i5-3210M. 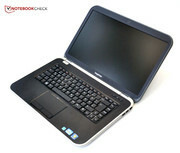 This processor is already quite powerful and offers about the same performance as the Sandy Bridge-based Core i7-2620M. Those needing more performance can opt for a quad-core processor. 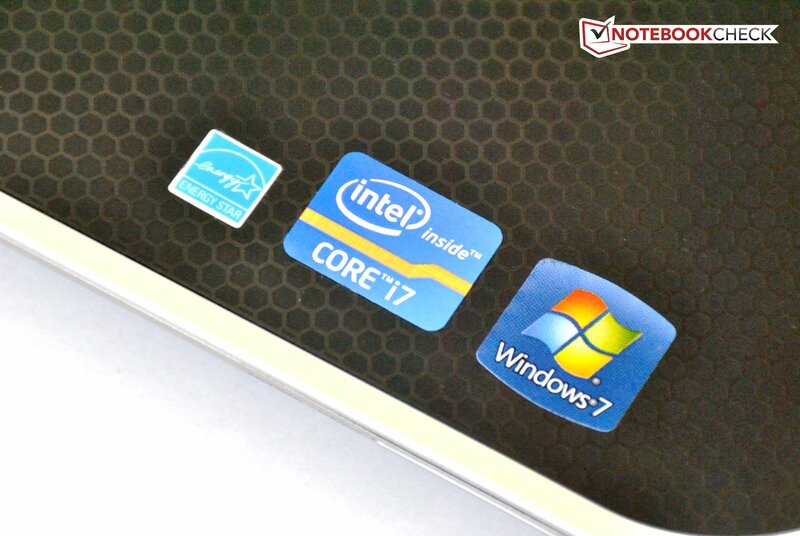 Performance-wise, the Intel Core i7-3612QM is not (like the name would imply), between the i7-3610QM and the i7-3615QM. 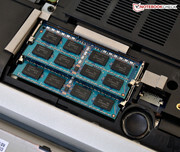 The latter processors have a TDP or 45 watts, whereas the i7-3612QM was designed for 35 watts. This means that the i7-3612QM is not quite as powerful, but it requires less cooling and is therefore suitable for thinner and more compact notebooks. 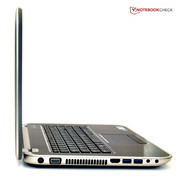 Graphics power is supplied by an AMD Radeon HD 7730M with 2 GB of RAM. Installed RAM varies by model - 4, 6, and 8 GB are options. The hard disk drive capacity is either 500 or 1000 GB. The Intel Core i7-3612QM has a core frequency of 2.1 GHz but overclocks via Turbo Boost if a performance increase is required. A single core can overclock to 3.1 GHz; all four cores still manage a healthy 2.8 GHz. The third-generation Intel Core Processors are part of the Ivy Bridge architecture and are manufactured using the 22 nm process. In the Cinebench R11.5 CPU test, the laptop scored 5.57 points, a result similar to the 11.6-inch subnotebook Schenker XMG A102 and the 17-inch Medion Akoya P7815, both of which use the same 3612QM processor. The new processor beats the second-generation Intel Core i7 2670QM, used in the higher-end multimedia notebook HP Envy 15-3040nr, by 0.45 points. For comparison: Intel's i7-3610QM standard (45W) CPU only manages 10% better performance. PCMark evaluates the overall system performance. It is comprised of different test suites designed to cover as many performance areas as possible. 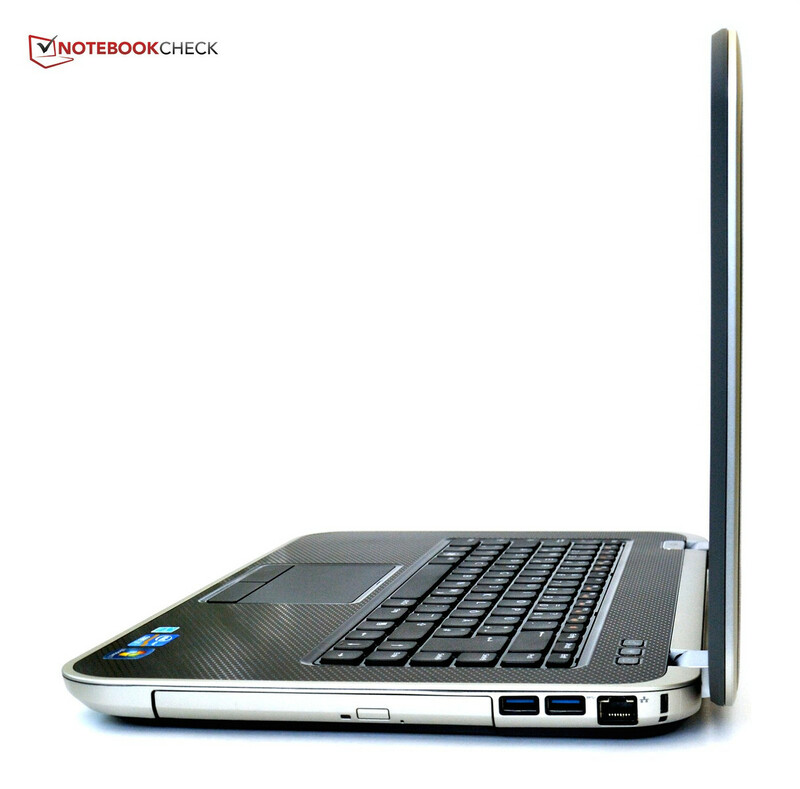 Using the current PCMark 7, the Inspiron scores 2318 points, which is identical to the Medion Akoya P7815, a system featuring the same processor, a better graphics card, but a slower hard drive. 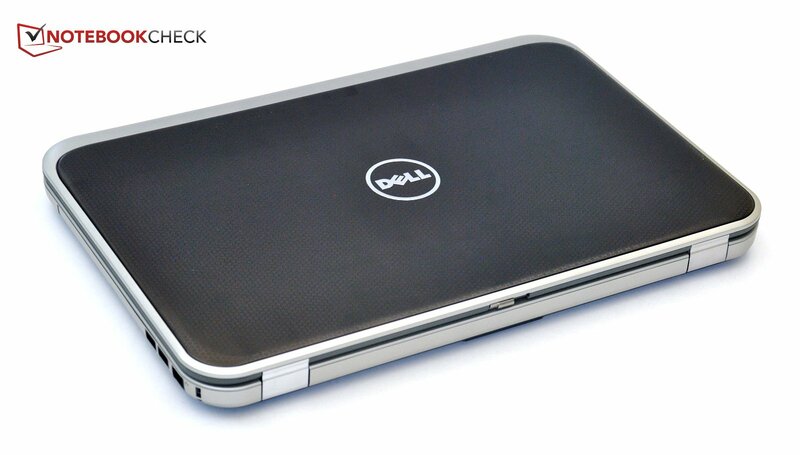 Dell offers the Inspiron 15R SE either with a 500 GB or 1 TB hard disk drive. Our system featured a Western Digital Scorpio Blue hard drive with a spacious 1 TB storage space. This hard drive spins at 5400 rpm, which has advantages as far as power consumption and noise level are concerned. Compared to 7200 rpm drives, data transfer rates tend to be lower though. This was not the case with this particular drive. We measured an average transfer rate of almost 83 MB/s - quite a bit faster than the 77.3 MB/s the Samsung SpinPoint M8 in the Medion Akoya P7815 could deliver. This means that the drive's performance is on par with 7200 rpm drives like the Hitachi Travelstar 7K500 and the Seagate Momentus 7200.4. Dell does not offer any (significantly faster) Solid State Drives, although a user should be able to install a SSD in place of the 2.5-inch HDD, if so desired. Addendum (07.12.2012): According to the spec sheet, a mSATA-SSD can be installed, although Dell currently does not offer one as an option on their website. 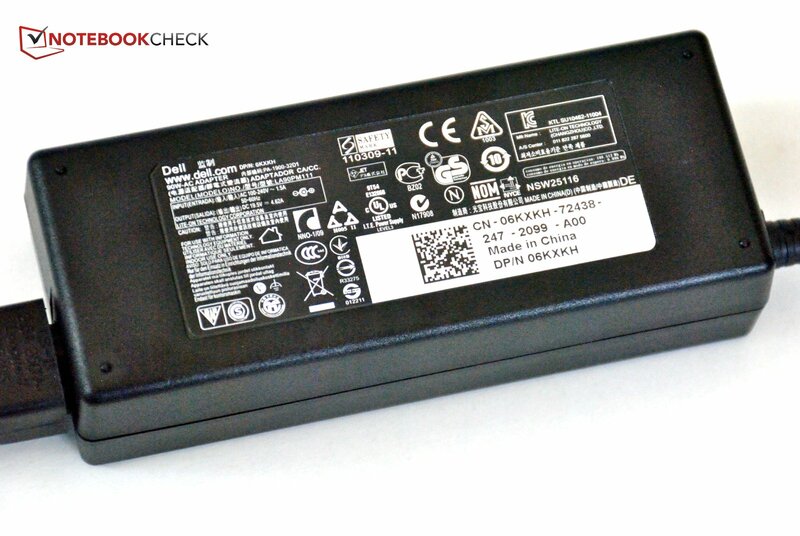 We were not able to locate the mSATA interface, but Dell ensured us that the interface is available and that customers are able to retrofit their laptop with a suitable SSD. 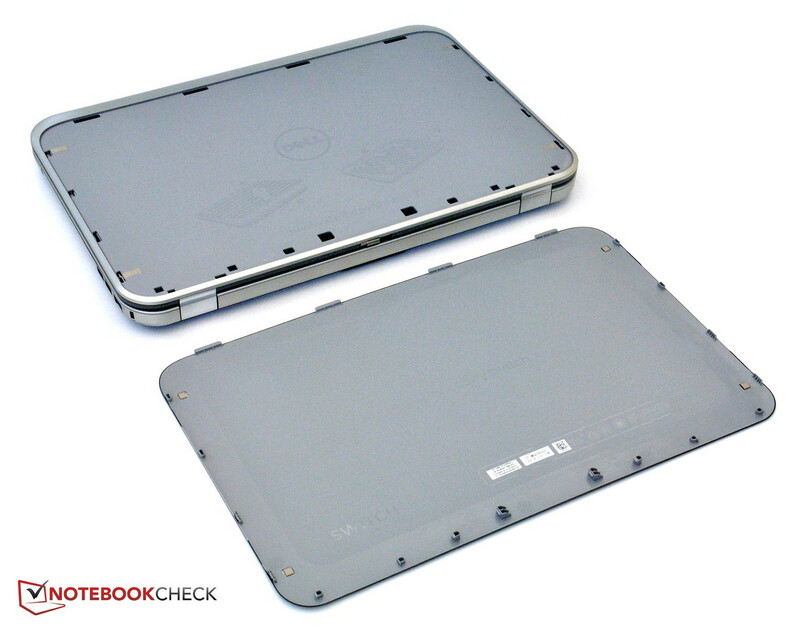 Addendum (07.13.2012): Dell clarified that the mSATA interface will only be installed should the notebook be ordered with a SSD. Installing a mSATA-SSD in the available slot is therefore not possible since the interface is missing (just like in our test sample). The above is true only for the Inspiron-series; XPS and Alienware models come with a mSATA interface. The Intel HD Graphics 4000 is integrated into the processor. This solution is sufficient for office applications or HD movies. When the demands to the graphics sub-system increase, the installed AMD Radeon HD 7730M can take over in real-time. AMD calls this approach in its new series "Enduro". The Radeon comes with 2 GB of RAM. For additional information please check here. The supposedly automatic switching between integrated graphics and AMD Radeon does unfortunately not work consistently. For quite a few games, we had to "force" the dedicated graphics card into action. Navigating the menu system to adjust these settings is still pretty cumbersome, since only the last used programs are displayed and the user is forced to track down additional programs on the hard disk drive. This is one area where NVIDIA's Optimus is clearly superior. The dedicated graphics card reached 1677 points in the latest 3DMark 11 test. This score puts it into the upper middle class. The NVIDIA GeForce GT 640M, featured in the Medion Akoya P7815 is a bit more powerful and scored 1879 points. The older AMD Radeon HD 6770M in the HP Pavilion dv6-6008eg scored quite a bit lower (1560 points). Those not expecting high-end graphics should be able to play quite a few of the current games. Most run without lag, as long as the quality is set to medium. Some games can be enjoyed with the quality set to high. Even though we had updated drivers, we were not able to play Max Payne 3 with DirectX 11. We could only get it to start with DirectX 9. Hopefully this issue will be resolved with the next round of driver updates. We measured between 30.8 and 34.2 dB during idle. 30 dB is barely audible but 34 dB is noticeable, although not annoying. The hard drive is fairly quiet at 31.5 dB - a side effect of the lower rotational speed of 5400 rpm. Depending on which application we used, we could either hear the hum of the hard drive or the fan. During undemanding office applications (surfing), the fan remained on the lowest level and was pleasantly quiet. The Blu-Ray drive is pretty audible at 35.2 dB, enough to be disturbing during quiet movie scenes. Under load, we measured above 40 dB. The Inspiron is definitely noticeable at those levels but still remains within acceptable limits. Temperatures are fairly well controlled during idle. We measured 29 °C (84 °F) in the middle of the keyboard. The right side remains the coolest at 24.5 °C (76 °F); the left side above the vents reached 28 °C (82.4 °F). At the underside of the laptop we measured 35.2 °C (94.5 °F) - not critical yet but getting a little uncomfortable with the unit in our laps. Temperature at the vent was 30 °C (86 °F). During the stress test, temperatures at the top near the fan reached 42.1 °C (107.8 °F). At the palm rest, we got varying results: to the right of the touchpad we measured a fairly cool 30 °C (86 °F), to the left 35 °C (95 °F). The underside also had a split personality: on the left we measured a cool 25 °C (77 °F), the cooling vents on the right had temperatures above 50 °C (122 °F). (±) The average temperature for the upper side under maximal load is 37.7 °C / 100 F, compared to the average of 30.9 °C / 88 F for the devices in the class Multimedia. A stress test forces the processor and the graphics cards into full-power mode for an extended period of time (over one hour). 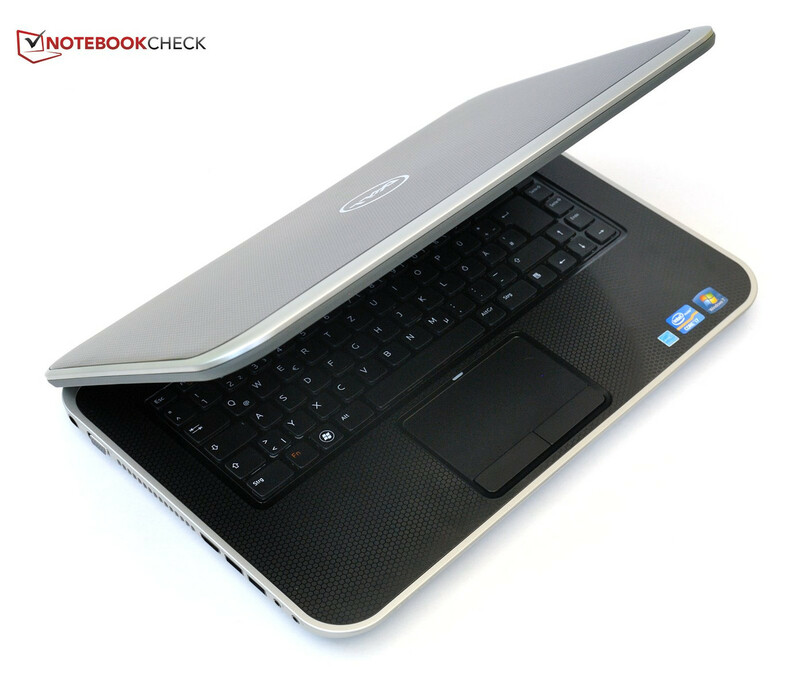 The cooling system has to maintain its efficiency to prevent the notebook from throttling performance in order to avoid overheating. During the first five minutes, Turbo Boost was able to keep the processor at the maximum of 2.8 GHz; in the ten minutes following, the frequency fluctuated between base operating (2.1 Ghz) and Turbo Boost. At the same time, temperature peaked at 94 °C (201 °F). After a total of 15 min, the processor stayed at the base operating frequency and temperature dropped to about 80 °C (176 °F). The performance of the graphics card remains unaffected during the stress test and the temperature fluctuates between 70 to 80 °C (158 to 176 °C). A subsequently run 3DMark 06 test showed the performance of the Inspiron at the same level as during a cold start. No temperature-based throttling could be observed. 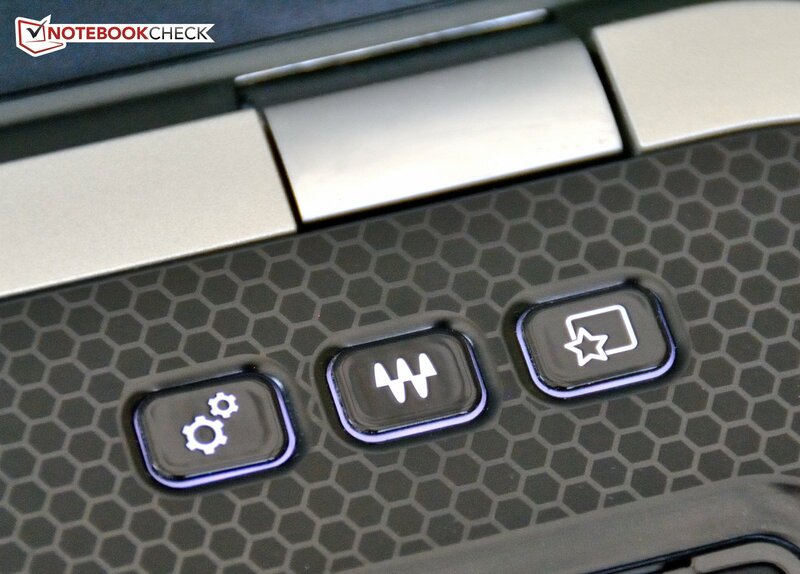 Dell heavily promotes the speakers in the Inspiron 15R. They are sourced from the US company Skullcandy and controlled using Waves MaxxAudio 4. The sound quality is definitely above average. Maximum volume is very high and the speakers never sound distorted. Unfortunately, there is no subwoofer in the Inspiron, so bass is severely lacking. While we can't recommend the Dell for audiophiles for that reason, for movie night or a presentation the system is perfectly usable. Power consumption with the display turned to the lowest setting, power-saver profile enabled, and WLAN turned off is around 10 watts - a very good value for a quadcore-multimedia notebook with dedicated GPU. Turning on WLAN, increasing display brightness, and switching the profile to high performance increases power consumption to a still very good 14.6 watts. Under load, we measured between 43 and 83 watts, depending on utilization. The laptop only reached the maximum during the stress test with the CPU in Turbo Boost mode (and as we mentioned earlier, this mode only lasts for about 10 min). The power adapter is rated at 90 watts and seems adequately sized. 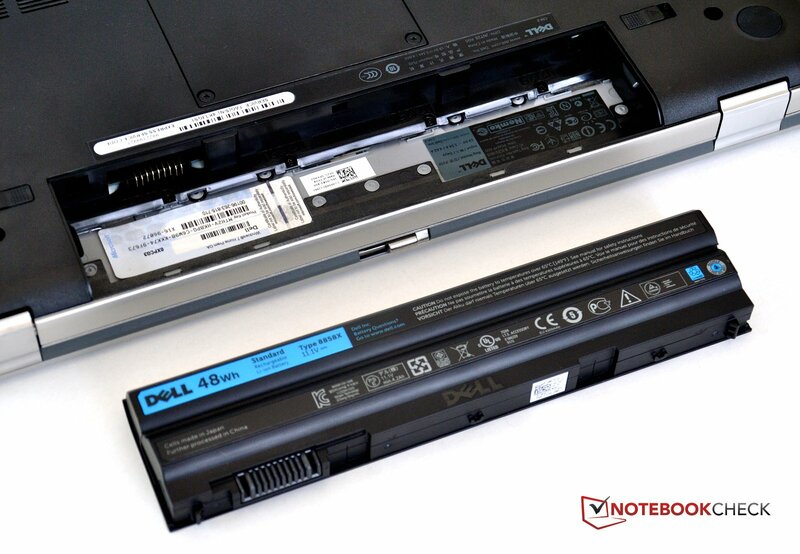 Dell ships the notebook with a 6-cell lithium-ion battery rated at 48 Wh. To determine the maximum run time during idle, we deactivated the WLAN, turned the display brightness all the way down, and enabled the power-saver profile. 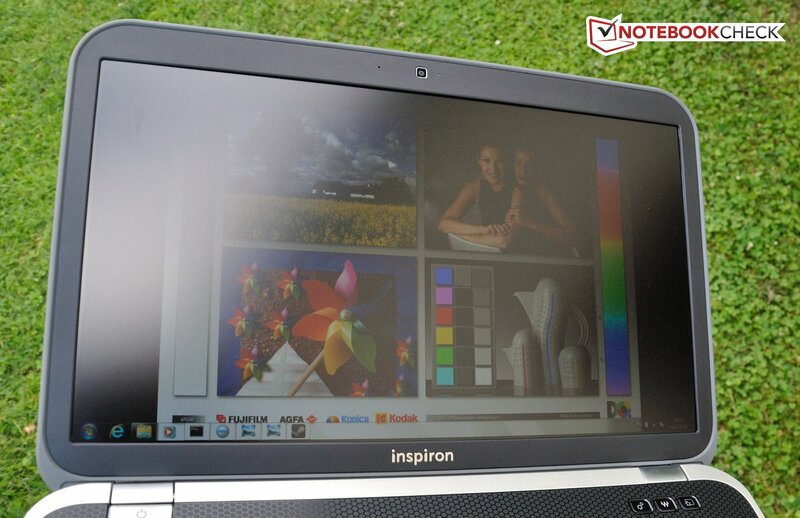 Our Inspiron manged to run for 4 hours and 45 minutes. To determine battery life using a more realistic scenario, we subjected the test candidate to our WLAN-surf-test. Surfing the internet using WLAN (via an automated script) with a display brightness of 150 cd/m², we measured a run time of 3 hours before having to plug in the adapter. Those wanting to watch a movie better check the feature length first: a DVD shouldn't be longer than 1 hour and 41 minutes, a Blu-ray 1 hour and 25 minutes. When we ran our load test using Battery Eater Classic, which renders an animated 3D-scene and places a heavy load on the processor and the graphics card, we recorded a run time of 1 hour. Charging the battery takes about 3 hours and 20 minutes. Although the processor is able to supply full power while the laptop is on battery, 3DMark 06 showed a drop from 9615 to 5291 points, indicating that the graphics subsystem is running at reduced capacity. 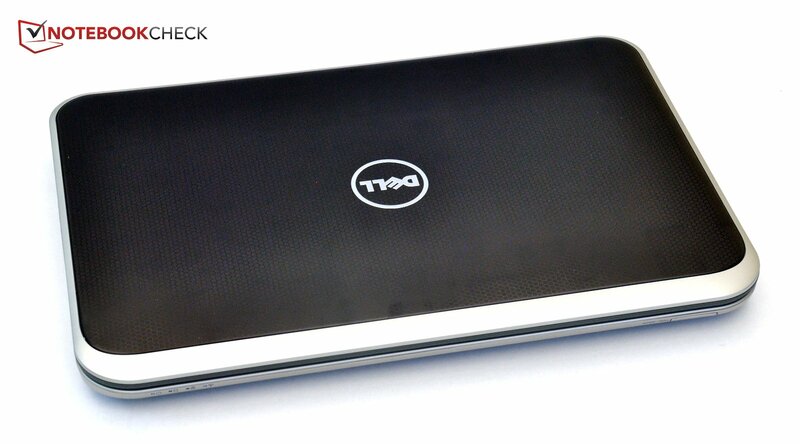 The Inspiron 15R Special Edition is designed to appeal predominately to the performance-oriented crowd. Dell spruced up the chassis with aluminum components and installed more powerful hardware to differentiate the model from the standard edition. 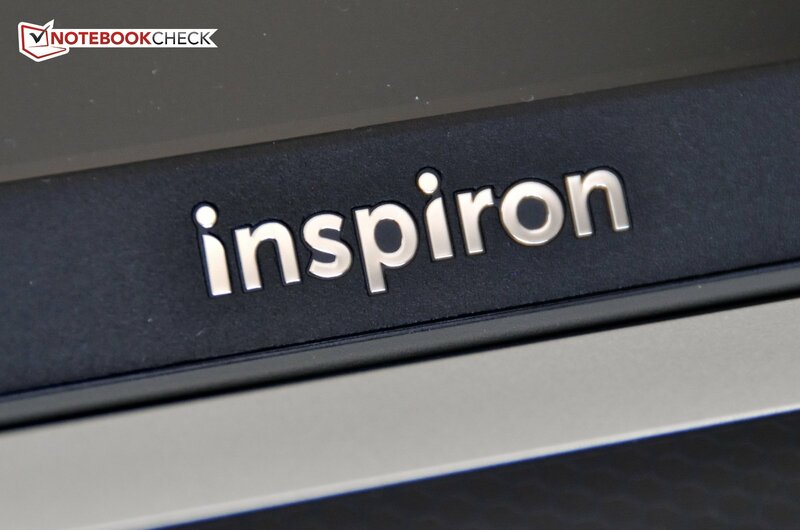 The Inspiron-series was completely redesigned. The models now have generously rounded corners and sport a timeless grey-black chassis. Build quality of the base unit and the display lid is good, although we noticed uneven gaps on the sides of the notebook. Features and port selection are above average. 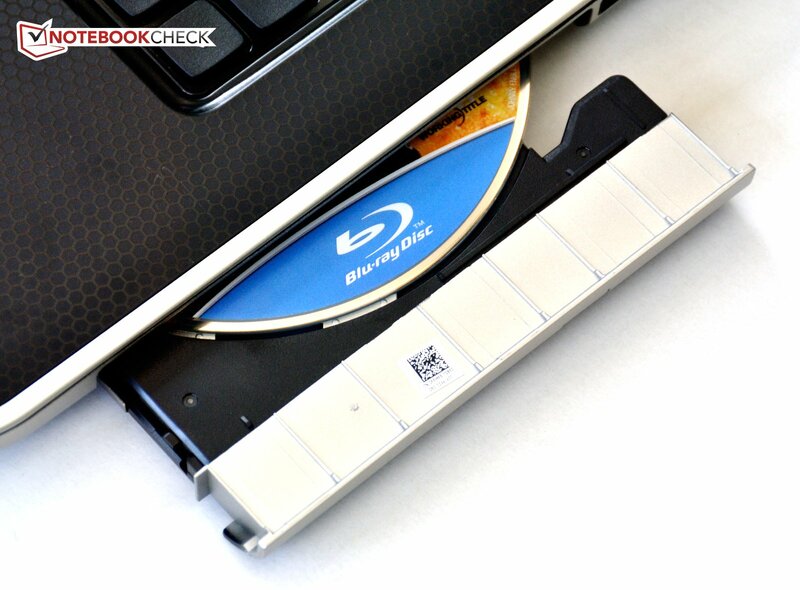 A Blu-ray optical drive, four USB 3.0 ports, and a card reader capable of reading almost all formats are all included. Networking components are up to date and include WLAN b/g/n, Bluetooth 4.0, and Gigabit-LAN. The input devices allow using the laptop for extended periods of time without any issues. 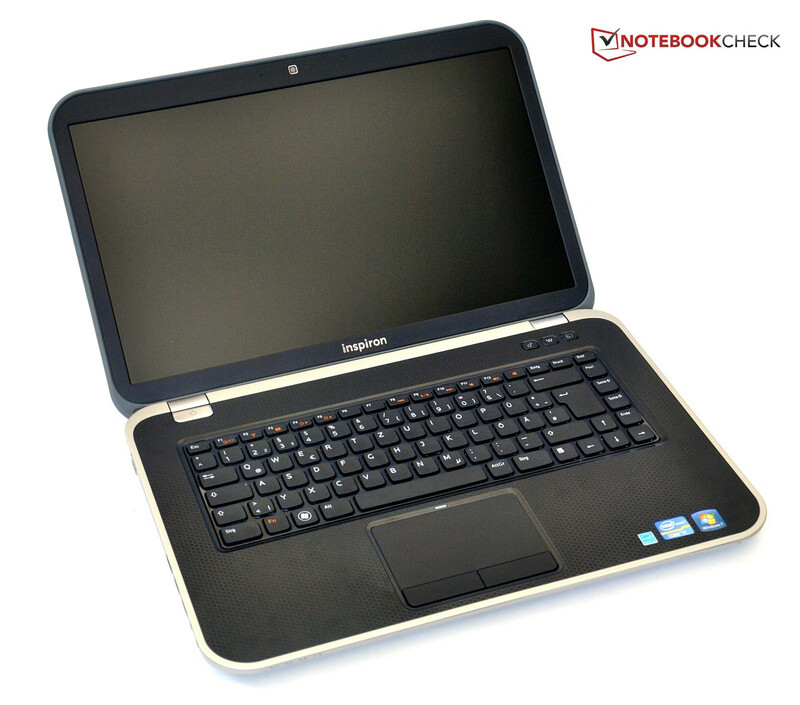 The keyboard, which provides good feedback, is also used in the Vostro notebooks. The touchpad is adequately sized and has very decent mouse buttons. The FullHD-display is a differentiating feature of the Special Edition compared to the standard Inspirons. Since it is very bright and none-glare, it can be used in bright conditions. 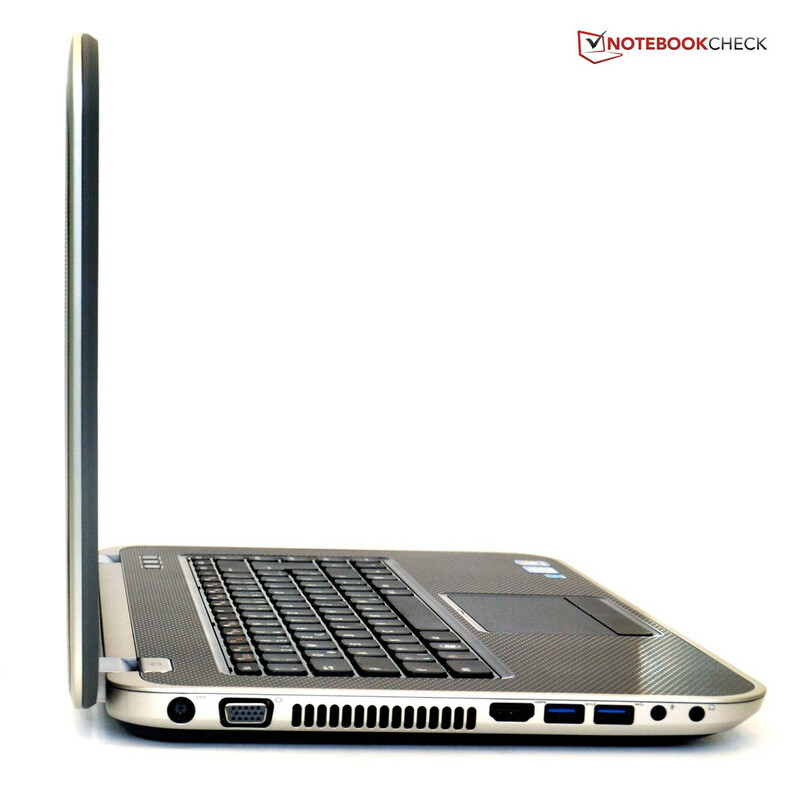 The generous viewing angles make using the laptop easier and allow several people to watch a Blu-ray movie. The contrast ratio is quite impressive. The Intel quad-core processor and the middle-class graphics card supplied by AMD allow decent performance and satisfy most use-case scenarios. Most current games can be played successfully in medium or sometimes even high quality mode. We were quite impressed with the very quiet and fast 1 TB hard disc drive. The notebook remains mostly silent but gets quite warm under load. 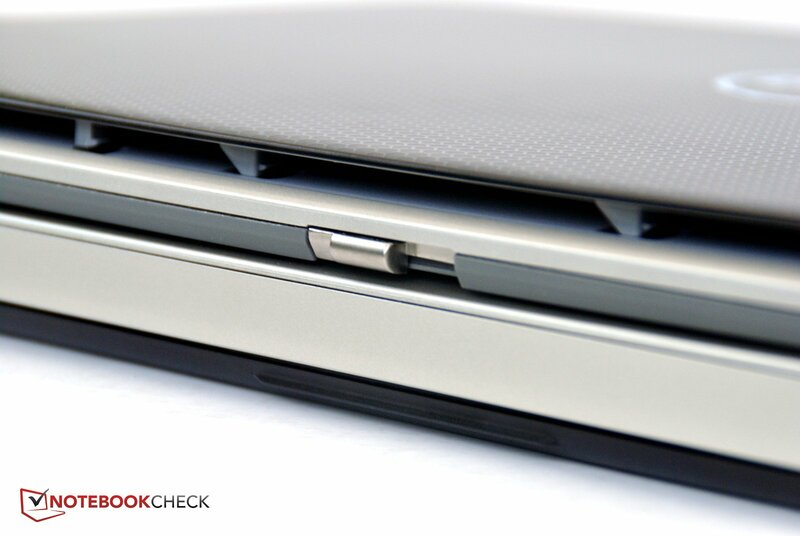 Manufacturers seem to pay more and more attention to the sound quality of their notebooks. 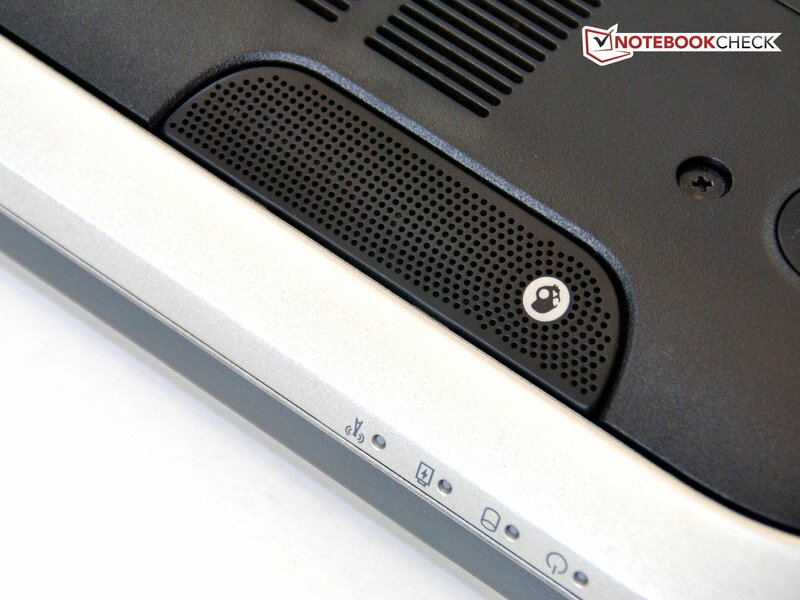 Skullcandy provides the speakers for the Inspiron. The sound is indeed very impressive, albeit lacking bass. 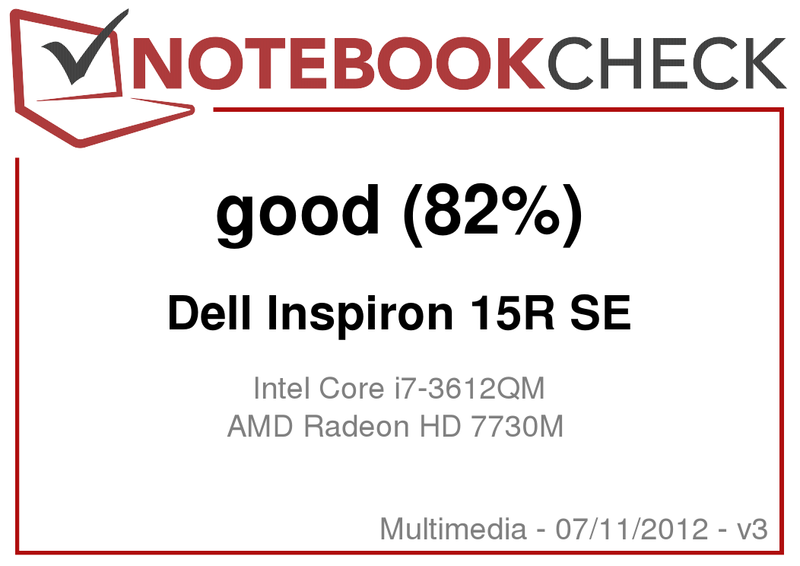 The Inspiron 15R Special Edition is a multimedia-notebook that manages to leave a very good impression in those areas where it really matters: a great display, well-designed input devices, and plenty of performance. Those not needing a long battery life should take a look at this great all-around performer retailing for about 900 Euro. ... which is able to read Blu-rays. The card reader isn't picky. A regular VGA connector is on bord. Advantage for those who are right-handed: no ports up front. It's a bit more cumbersome for lefties. The bottom is flat and has many cooling vents. Underneath are the serial numbers. ... we find the hard disk drive. This one is 1 TB and spins at 5400 rpm. The RAM-slots are easy to get to. But both in use with 2x 4 GB DDR3. The power adapter supplies 90 watts. ... for the display cover and palm rest. The speakers are from Skullcandy. The webcam has 1 MP. ... allows removal of the lid. The display can tilt back a maximum of 140°. A pretty impressive port selection. Dell not changing the name of the new models and making things confusing for the customer.